What defines PBK Pillar, Pushing through Resistance, better than 11-year-old Julia Mulvaney? Mulvaney, who attends the Personal Best Karate in Norton, was part of the Training Cycle this past spring, a candidate for Second Degree Black Belt, which she earned in June 2018. The cycle started with her tending to a twisted ankle that happened outside of class, not letting it slow her down. Then in March, she broke her elbow during an event with her cheerleading squad. The clean break allowed her to have the cast on for a limited time and due to some scheduled Friday holidays with Training Cycle and the will to stay in and work hard, she never missed a class because of her injuries. "Julia works really hard, she's super focused and never lets anything stop her from reaching her goals," said her instructor, Master John Camara. "I'm not surprised that she did everything she could to stay in the cycle." Mulvaney, a flyer for the cheer squad, won states last year and has been competing for four years. She also began competing with the PBK Competition team as well, loving the atmosphere of the events. "I love competing," she said. "I love working hard for something and then being able to say I did it myself." 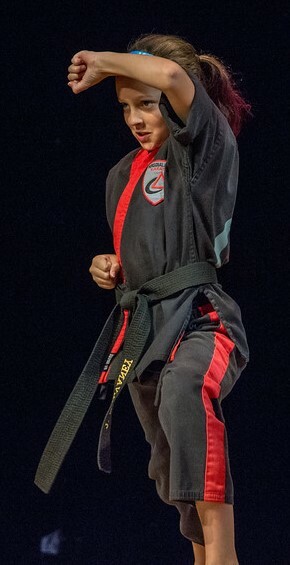 Having been a PBK member since she was three-years-old, Mulvaney follows in the footsteps of her older brother, Thomas, 14, a Second Degree Black Belt. "We knew karate would teach them about being respectful, having responsibility, encouragement - qualities the world holds them to a certain standard but they don't always get taught that in the schools," said Tom Mulvaney, Julia's father, about why he and his wife started their children at Personal Best. "And we knew the physical skills will be with them forever. Especially for Julia, preparing her for more than just defending herself against bullies." Mulvaney's favorite part about class? "I love coming to class and focusing on getting better, and I like learning new forms, but I love seeing all my friends," she said. "I have friends from all different towns and this is the only place we are together. I just have a lot of fun."